DELAFIELD, Wis. (Stockpickr) -- There isn't a day that goes by on Wall Street when certain stocks trading for $10 a share or less don't experience massive spikes higher. Traders savvy enough to follow the low-priced names and trade them with discipline and sound risk management are banking ridiculous coin on a regular basis. Just take a look at some of the big movers in the under-$10 complex from Thursday, including Merrimack Pharmaceuticals (MACK, which is exploding higher by 64%; MaxLinear (MXL, which is ripping higher by 23%; Pacific Biosciences of California (PACB, which is soaring to the upside by 19%; and CytRx (CYTR, which is trending sharply higher by 14%. You don't even have to catch the entire move in lower-priced stocks such as these to make outsized returns when trading. Low-priced stocks are something that I tweet about on a regular basis. I frequently flag high-probability setups, breakout candidates and low-priced stocks that are acting technically bullish. I like to hunt for low-priced stocks that are showing bullish price and volume trends, since that increases the probability of those stocks heading higher. These setups often produce monster moves higher in very short time frames. When I trade under-$10 names, I do it almost entirely based off of the charts and technical analysis. I also like to find under-$10 names with a catalyst, but that's secondary to the chart and volume patterns. With that in mind, here's a look at several under-$10 stocks that look poised to potentially trade higher from current levels. One under-$10 renewable fuels player that's starting to trend within range of triggering a big breakout trade is KiOR (KIOR, which produces and sells cellulosic gasoline and diesel from lignocellulosic biomass using its proprietary biomass-to-cellulosic fuel technology platform. This stock has been hammered by the sellers so far in 2014, with shares down by a whopping 61%. If you take a look at the chart for KIOR, you'll see that this stock has pulled back over the last month, with shares moving lower from its high of $1.06 to its recent low of 53 cents per share. During that move, shares of KIOR have been making mostly lower highs and lower lows, which is bearish technical price action. That said, shares of KIOR have now found buying interest at 53 cents per share and the stock is rebounding higher here and breaking out above some near-term overhead resistance at 62 cents per share. That move is quickly pushing shares of KIOR within range of triggering a big breakout trade. Traders should now look for long-biased trades in KIOR if it manages to break out above today's high of 65 cents per share to some more near-term overhead resistance at 69 cents per share with high volume. Look for a sustained move or close above those levels with volume that hits near or above its three-month average action of 1.59 million shares. If that breakout triggers soon, then KIOR will set up to re-test or possibly take out its next major overhead resistance levels at 80 cents per share to its 50-day moving average of 87 cents per share. 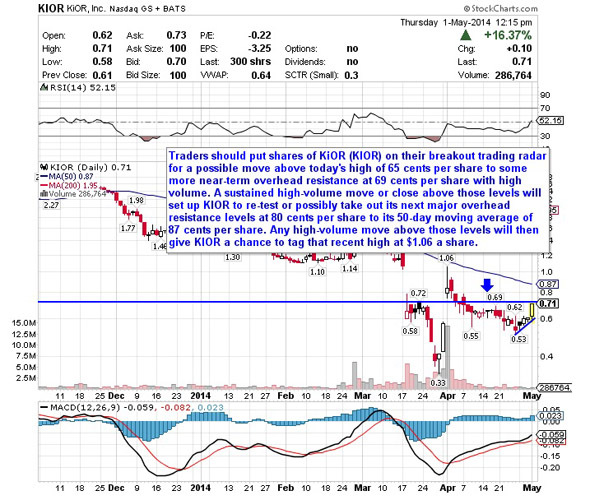 Any high-volume move above those levels will then give KIOR a chance to tag that recent high at $1.06 a share. Traders can look to buy KIOR off weakness to anticipate that breakout and simply use a stop that sits right around that recent low of 53 cents per share. One can also buy KIOR off strength once it starts to take out those breakout levels with volume and then simply use a stop that sits a comfortable percentage from your entry point. Another under-$10 patent player that's starting to move within range of triggering a big breakout trade is Vringo (VRNG, which develops, acquires, licenses, protects and monetizes intellectual property worldwide. This stock has been on fire so far in 2014, with shares up sharply by 40%. If you take a look at the chart for Vringo, you'll notice that this stock has just started to bounce sharply higher right off its 50-day moving average o $3.82 a share. That bounce has started to push shares of VRNG into breakout territory, since the stock has started to flirt with some near-term overhead resistance at $4.10 a share. 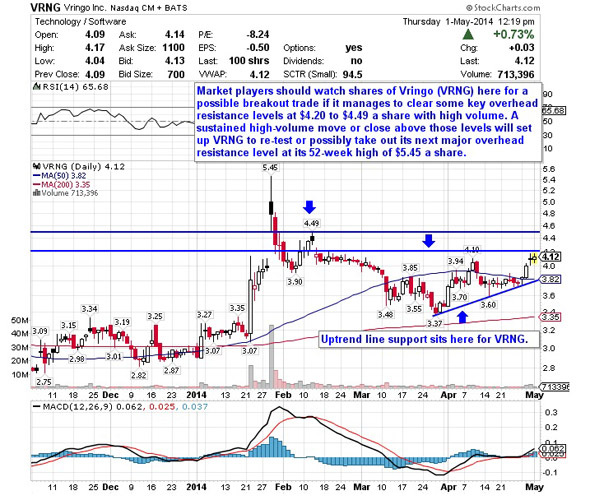 Shares of VRNG are now setting up to trigger another big breakout trade that could send this stock much higher. Market players should now look for long-biased trades in VRNG if it manages to break out above some key overhead resistance levels at $4.20 to $4.49 a share with high volume. Look for a sustained move or close above those levels with volume that registers near or above its three-month average volume of 1.81 million shares. If that breakout materializes soon, then VRNG will set up to re-test or possibly take out its next major overhead resistance level at its 52-week high of $5.45 a share. Traders can look to buy VRNG off weakness to anticipate that breakout and simply use a stop that sits right below its 50-day moving average of $3.82 a share. One can also buy VRNG off strength once it starts to clear those breakout levels with volume and then simply use a stop that sits a comfortable percentage from your entry point. 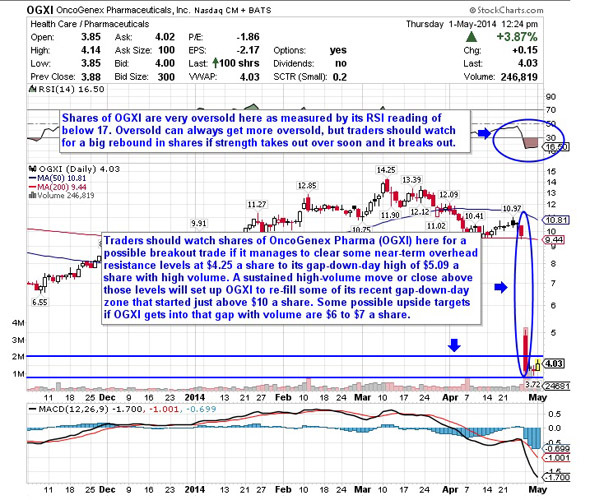 One under-$10 biopharmaceutical player that's starting to move within range of triggering a near-term breakout trade is OncoGenex Pharmaceuticals (OGXI, which develops and commercializes therapies that address treatment resistance in cancer patients. This stock has been destroyed so far in 2014, with shares down sharply by 51%. If you take a look at the chart for OncoGenex Pharmaceuticals, you'll see that this stock recently gapped down sharply from over $10 a share to its new 52-week low of $3.72 a share with heavy downside volume. That move has now pushed shares of OGXI into extremely oversold territory, since its current relative strength index reading is below 17. Following that massive move lower, shares of OGXI are now starting to bounce higher and it's quickly moving within range of triggering a big breakout trade. Traders should now look for long-biased trades in OGXI if it manages to break out above some near-term overhead resistance levels at $4.2 a share to its gap-down-day high of $5.09 a share with high volume. Look for a sustained move or close above those levels with volume that hits near or above its three-month average action of 361,090 shares. If that breakout kicks off soon, then OGXI will set up to re-fill some of its recent gap-down-day zone that started just above $10 a share. 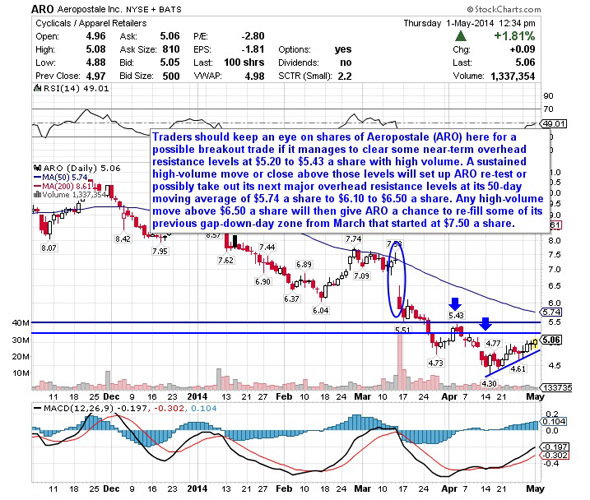 Some possible upside targets if OGXI gets into that gap with volume are $6 to $7 a share. Traders can look to buy OGXI off weakness to anticipate that breakout and simply use a stop that sits right below its 52-week low of $3.72 a share. One can also buy OGXI off strength once it starts to take out those breakout levels with volume and then simply use a stop that sits a comfortable percentage from your entry point. Another under-$10 biotechnology player that's starting to trend within range of triggering a near-term breakout trade is Ohr Pharmaceutical (OHRP, which focuses on the development of its two products, OHR/AVR118 for the treatment of cancer cachexia (multi-symptom wasting disorder) and Squalamine for the treatment of the wet form of age-related macular degeneration using an eye drop formulation. This stock is off to a decent start so far in 2014, with shares higher by 23%. If you look at the chart for Ohr Pharmaceutical, you'll notice that this stock has been downtrending badly over the last two months, with shares plunging lower from its high of $20 to its recent low of $9.02 a share. During that downtrend, shares of OHRP have been consistently making lower highs and lower lows, which is bearish technical price action. That said, shares of OHRP have now started to stabilize a bit right above its 200-day moving average and it's found some buying interest each time its pulled back towards $9 a share. Shares of OHRP are now starting to bounce off its 200-day and it's quickly moving within range of triggering a near-term breakout trade. Market players should now look for long-biased trades in OHRP if it manages to break out above some near-term overhead resistance levels at $9.98 to $10.20 a share with high volume. Look for a sustained move or close above those levels with volume that registers near or above its three-month average action of 355,820 shares. If that breakout hits soon, then OHRP will set up to re-test or possibly take out its next major overhead resistance level at $10.85 a share. Any high-volume move above that level will then give OHRP a chance to re-fill some of its previous gap-down-day zone from earlier this month that started at $14 a share. Traders can look to buy OHRP off weakness to anticipate that breakout and simply use a stop that sits right below its recent low of $9.02 a share. 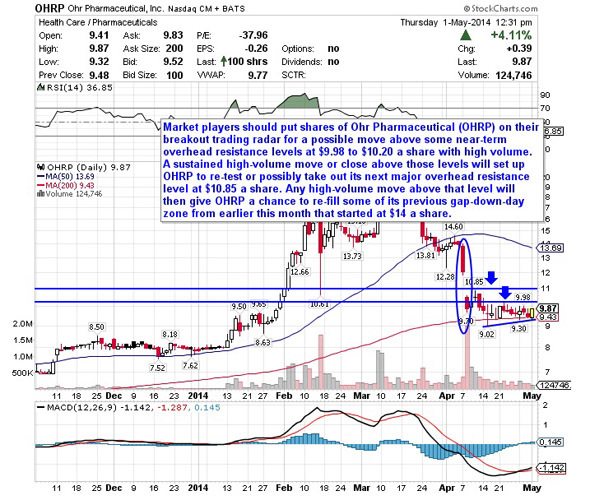 One can also buy OHRP off strength once it starts to bust above those breakout levels with volume and then simply use a stop that sits a comfortable percentage from your entry point. One final under-$10 apparel player that's starting to trend within range of triggering a near-term breakout trade is Aeropostale (ARO, which operates as a mall-based specialty retailer of casual apparel and accessories. This stock has been hit hard by the sellers so far in 2014, with shares off sharply by 44%. If you take a glance at the chart for Aeropostale, you'll see that this stock has been downtrending badly over the last six months, with shares sliding sharply lower from over $10 a share to its recent 52-week low of $4.30 a share. During that downtrend, shares of ARO have been consistently making lower highs and lower lows, which is bearish technical price action. That said, shares of ARO have now started to rebound higher off that $4.30 low and it's quickly moving within range of triggering a near-term breakout trade. Traders should now look for long-biased trades in ARO if it manages break out above some near-term overhead resistance levels at $5.20 to $5.43 a share with high volume. Look for a sustained move or close above those levels with volume that hits near or above its three-month average action of 4.18 million shares. If that breakout kicks off soon, then ARO will set up re-test or possibly take out its next major overhead resistance levels at its 50-day moving average of $5.74 a share to $6.10 to $6.50 a share. Any high-volume move above $6.50 a share will then give ARO a chance to re-fill some of its previous gap-down-day zone from March that started at $7.50 a share. Traders can look to buy ARO off weakness to anticipate that breakout and simply use a stop that sits right below some key near-term support at $4.61 a share or near that 52-week low of $4.30 a share if you want to give it more room. One can also buy ARO off strength once it starts to take out those breakout levels with volume and then simply use a stop that sits a comfortable percentage from your entry point. To see more hot under-$10 equities, check out the Stocks Under $10 Setting Up to Explode portfolio on Stockpickr. The government insurance giant reports strong top- and bottom-line results and raises its 2019 forecast. Harley-Davidson posted weaker-than-expected first quarter earnings Tuesday as tariffs and trade disputes hit global sales for the iconic motorcycle maker, but shares got a boost from a Tweet from President Donald Trump. Twitter shares surged Tuesday after the micro-blogging website posted stronger-than-expected first quarter revenues as monthly active users increased amid moves to remove harmful content and hate speech from the main platform.